Bedroom curtains are decorative and functional accessory for bedroom that will give a perfect look to your bedroom design. They keep away the sunlight to let into your bedroom and also give you privacy from outside. If you need insulation and soundproofing in your bedroom, then you can choose the lined bedroom curtains. While choosing bedroom curtains, then first you have to check the length and width of the bedroom windows and doors. It’s up to you whether you want to hang bedroom curtains to cover the windows completely or just before the floor. Curtains are available in various colors, designs and styles and you can choose the best one according to your bedroom style. Sheer curtains go well with any type of style and décor. You can match the color of bedroom curtain with the rest furnishing of the bedroom and create a unique style that will complement your bedroom design. If you wish to introduce a mystic aura in your bedroom, then choose linen curtains with hues of blue and maroon that will increase the grace and glow of your bedroom definitely. For modern themed bedrooms, you can use bold-colored linen curtains. You can also apply muted and dark colors like purple, black, dark brown and grey. Linen bedroom curtains are inexpensive and turn your bedroom in to a simple and cool zone. A countless varieties of styles and colors are available in the market and give you the opportunity to choose the desired colors. Choose durable and easily cleanable linen curtains for your bedroom. Box pleated bedroom curtains are frequently used in the bedrooms. These bedroom curtains consist of pleats which are pleated at the top of the curtain and offer a neat and customized look to your bedroom. Box pleated bedroom curtains are expensive as compared to the plain curtains. But you can add a classy look to your bedroom design by using box pleated curtains. 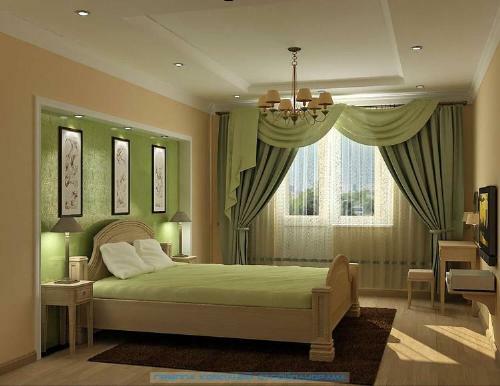 If you go for romantic atmosphere in your bedroom, then sheer or transparent curtains works best. With sheer curtains, you can disperse colored light into your bedroom. Sheer curtains are available in plain and textured patterns. If you choose the curtain cloth with flowers or intricate embroidery, then you can magnify the desired effect with creative ideas. With this amazing and great idea, you can enhance the look of your bedroom interior with an exciting environment. 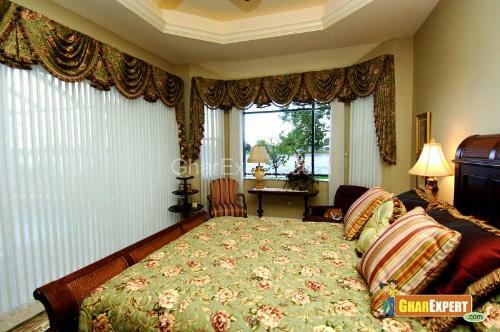 Nowadays sheer curtains are gaining popularity as they impart spacious look to your bedroom. The pro of sheer curtain is that they can allow a lot of sunlight in your bedroom but the problem is that they can’t afford the privacy in the bedroom. But you can also use sheer curtains with drapes to give you privacy in your bedroom. Swag and jabot style curtain offers a welcoming look to your bedroom interior. You can use this style in any room. There are different ways to mount swag and jabots in your bedroom. You can use single, double or triple swags for your bedroom curtains. Now one type of fabric is used to drape over a rod to form both swag and jabot. Swag and jabot style bedroom curtains need heavy fabrics to prepare.